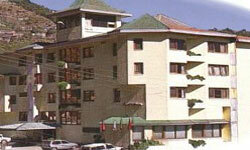 About Hotel: Asia The Dawn Hotel Shimla is located in a manner so as to give a grand, sweeping view of the breath taking scenario all around. It has been conceived in a manner, to provide you the ultimate in comfort, luxury and relaxation. Description: Asia The Dawn Hotel Shimla is located in a manner so as to give a grand, sweeping view of the breath taking scenario all around. It has been conceived in a manner, to provide you the ultimate in comfort, luxury and relaxation.